Transform your conservatory is a space you’ll love to lounge in with our fabulous side blinds. We’ve a wide range of colours and patterns to choose from. Our beautiful Roller blind designs will transform the sunniest room of the home. Our Pleated blinds are perfect for both side windows and conservatory roofs. Fully-lined luxury that’s perfect for adding elegant style to your conservatory. Discover our range of conservatory Wooden blinds. From painted slats to wood stains, there’s something for every space. A practical way to filter light into your conservatory, ideal for larger windows and doors. When it comes to your conservatory side windows, you can choose a blind from our entire range. That’s more than 850 styles, giving you a chance to create a look that mirrors your design ideas. Different blind types help you to manage sunlight in specific ways and your specialist in-home advisor can talk you through the benefits of each. You may want to coordinate the style of your conservatory with the rest of your home décor. Roller blinds and Roman blinds are a great option, as there are so many gorgeous designs and fabrics to choose from. 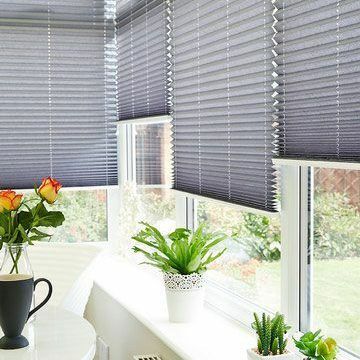 Alternatively an uninterrupted view of your garden might be your priority, in which case Venetian, Vertical or Wooden blinds would be a good choice, as you can adjust the slats to filter the sun without compromising the view. If you like a fuss-free finish, our Perfectfit frames are especially appealing. These clever frames clip into place in your uPVC windows, with your blind sitting neatly within. There’s no need for drilling and no control cords either. And if you’re concerned about maintaining a constant temperature our ThermashadeTM Pleated blinds are the perfect solution. They have a unique honeycomb cell structure which keeps the heat in when it’s chilly and stops the sunlight being absorbed when it’s hot outside. During your in-home appointment, your specialist advisor will explain all the options and give you expert advice on the best options for your space. Whether you’re choosing just one blind or a whole set, we’ll take exact measurements of your conservatory and return to fit your made-to-measure blinds, all as part of our standard service. Request an in-home appointment today to browse our extensive selection of Conservatory blinds.